When I was pregnant with my oldest, candy bar wrapper birth announcements were the new thing. This new take on that, Hershey Kisses baby announcements, are even cuter. Probably easier to pull off too. They would be fun little treats for a baby shower as well (if you already have the name picked out)! You could even do a set. One with the name, and another with the birth date, a third with the stats. I mean who just eats ONE Hershey kiss? No one right? Please tell me no one eats just ONE! 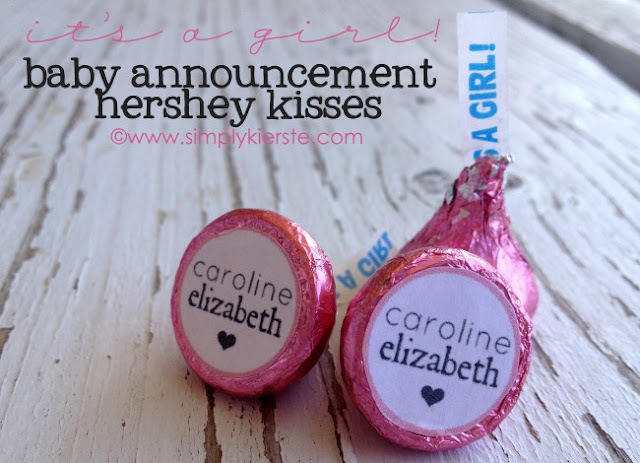 You can see a tutorial and get a template for these baby announcement Hershey kisses over at Simply Kierste.